Cats can’t sweat like humans; they can only cool themselves through panting or sweating through their foot pads. If their body temperature gets too high, they will suffer heat exhaustion and eventually heat stroke, just like a human. In that case it’s important to bring the body temperature down quickly. Breeds with short faces and obese cats are at the greatest risk. If your cat shows these signs, move them to a cool place and provide plenty of water. If the cat’s body temperature continues to rise, they will collapse. They may have seizures, slip into a coma, and eventually die. Do not leave cats in cars, especially on sunshiny days – a car parked in the sun reaches dangerous temperatures in minutes. Do not lock your cat on a sunny lanai or similar without an option for cooling off. 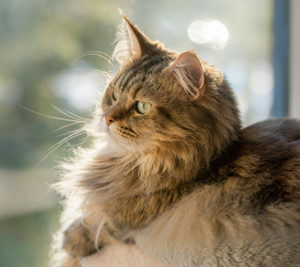 If your cat is conscious, but you suspect heat exhaustion, bring them to a cool environment, soak with cool (not ice cold) water, and provide water to drink. Go to your veterinarian or the pet ER. If you find your cat unconscious in a hot environment, soak them with cool water, but be careful to keep it out of their nose and mouth. Place a bag of ice or something frozen between the legs to help reduce their core temperature, and go to your veterinarian or the pet ER. Time is of the essence!